There are always new horror games out there to be played, each containing their own experience and story to follow. While most games follow a singular story that is -for the most part- pretty direct on their purpose and reasoning, the same can not be said for The Beast Inside by Illusion Ray Studio. The games story is set in the modern day. You play as Adam, who, when moving into a secluded forest home with his wife, discovers that the movers simply dropped off all their stuff on the patio and left. Now tasked with setting up his home, he makes his way through the home to store his stuff and ends up in the attic where he finds a strange journal belonging to a previous tenant of the home. 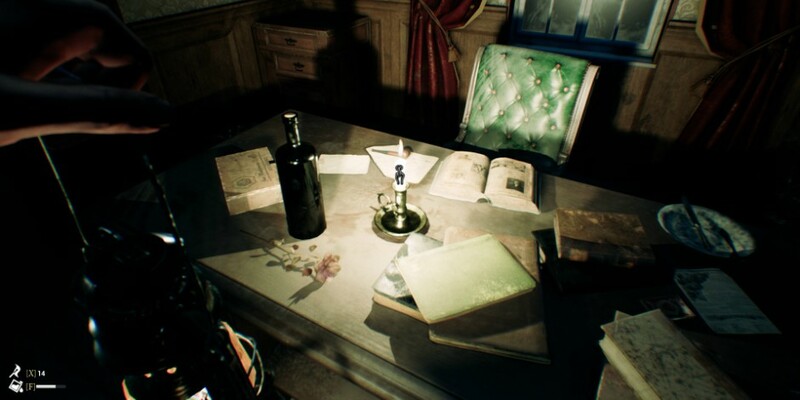 This is where the game takes a turn and begins to focus on horrific flashbacks sparked by the journal. Starting out in a calm, well lit home, everything seems to be normal at first. As you start to put Adam's things away, storing most of the boxes in the attic, you come across a puzzle box. This puzzle is difficult but solvable. Inside the puzzle box is the journal that takes you to the next part of the game. The true horror lies in the flashbacks, at least according to the demo. When you go to an old era of the home, playing as its previous tenant that is home in the dark of night, you will start to hear and experience some scary events. It's in this chapter that you will encounter your first entity/ghost/something else at the end. The developers did a great job creating an eerie atmosphere and events to follow, making you feel curious, helpless, and stupid at the same time. The controls are really smooth with a gradual head bob that doesn't make you dizzy nor over exaggerate. Interacting with items is easy and based on the weight of the object; A vase is easy to pick up and move around while a chair takes more effort. I like the concept, but it is a bit annoying to pick up the heavier objects that you have to move because of just how restraint they put on the mouse movement during the movement attempt. In the second chapter, when you are surrounded mostly in darkness, you are presented the option to use an oil lamp or matches to see through the dark. You have to find oil and matches for both of these, but with them you can light up candles around the house (which seem to get blown out every time a new event occurs) and can even hold them up in front of you to see as you traverse the grounds and house. The oil does seem to run out pretty quickly, so don't spend time just looking around with it because you will need it later. The matches don't provide a lot of light, even when held out in front of you, so that is not something you want to rely on. I hope they add an option to raise the brightness later on so that you don't end up in helpless situations where you are fumbling around through the dark rather than experiencing the game. The visuals of the game are pretty crisp and lifelike. The proportions of all the objects and characters in the game are well done. Little details, like a lamp shaking on the wall outside while there isn't any wind, added to the atmosphere along with the cramped house style and mostly dark lighting. There isn't a lot of music that plays which forces the player to be left in silence, listening for anything that shouldn't be there. It is always a great choice, in my opinion, to not have music for experience horror games because then it is all about the situation the player is in that makes them uneasy. Moving items around has well matched sound effects as well, which adds to the immersion the game provides. I really enjoyed the demo and it did a great job making me worried about what was going to happen next. The full game launch is no doubt going to be worth keeping an eye on. I am hoping to spend more time in the flashback scenes since that seems to be where most of the horror is, but there is an opening cut scene that makes me very curious as what is going to happen with Adam and his wife. Is it the house that is cursed or something worse? My curiosity is peaked and intrigued for this story to unfold and look forward to launch! Originally learning about this game through an interview I had with the developers a while back, I was excited to be able to snag the gameplay demo of the game thanks to my contribution into their Kickstarter; which is already 50% funded. Even though the demo offer was only for the first 48 hours, this is worth pushing to completion for sure!